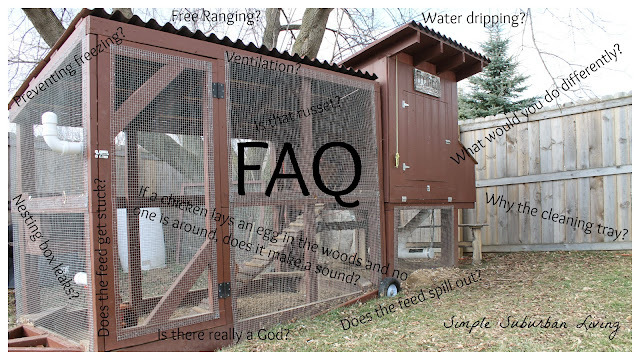 Over the past year I have received overwhelming support and feedback on my chicken coop design and construction. There have been so many wonderful comments and so many have copied this coop and made it one of their own. During this chicken coop building season (yes there is a season for these things) I have received quite a few questions on various aspects of the coop and so I thought it would be nice to run through and answer a few of the ones I hear most frequently. Does the feed get stuck in the feeder? Does the feed spill on the ground? The feed has no trouble gravity feeding down the center pipe and into each trough on the sides. While the chickens eat they shake it a bit and the feed gently falls down where they can get to it with no trouble. Some feed does spill out, especial when the feeder is full. This has not been an issue as they scratch and peck and get at it off of the ground and also get some needed grit in the process. Does a lot of water drip on the ground? In short, yes, however this has not really been an issue outside the coop as I have sand under it and it drains right away. Inside the coop I have a deflector that direct the extra drips into the cleanout pan and bedding. What about ventilation? I have a small window above the nesting boxes that was not shown in the construction video. This provides good airflow in the summer. In the winter, we have the door open tot he coop all day and there are enough cracks and gaps in the siding to allow for decent air to get in. Why don't you let them free range? We have tried letting them out in our yard a little at a time and they just do too much damage too quickly. They tear into the garden, scratch through the mulch around the trees, poop all over the grass, and eat anything we have growing in the garden. We designed the chicken tractor to move them around and let them scratch through the grass in a contained area. We also let them loose in the garden in fall when we are done growing. How do you prevent freezing? This year we used heat tape and insulation to wrap the outside portion of the watering system. This was not sufficient to keep the inside portion thawed as well when we had sustained temps below 0 degrees. I will redesign and only heat the inside portion this year. video to follow. What would you do differently? First I would make the cleanup tray access door about 2 inches larger to allow for a heaping pile of bedding to fit out on top of the tray when I pull it though (suggested by a subscriber, thanks!). I would also have used larger door latches instead of those cheap bolt locks on the chicken run door. Lastly, I would have raised the nesting boxes up about 4 inches from the main coop floor. Is the cleanout tray needed and worth it? This is completely up to you. I personally love it and I think it makes it so easy to just pull it out on the wheel barrow and take it back to dump it. You can just leave it out and pull up the wheel barrow next tot he coop and sweep the bedding out. Either way it is still super easy to clean. I hope that helps answer some of the common questions. If you have any comments or questions I did not answer please let me know! I placed my roosts running from the wall where my door is to the wall where the nesting boxes are. They can be 18"-24" off the floor or even higher and they seem to get up there just fine. Hope that helps and good luck with your build! Great design and I more or less replicated it. B/c I'm in South SF (California), I realize I didn't really need a door to open/close b/c the coldest it gets is the 40's, which seems OK for the hens (FYI, I've got 5 rescued White Leghorns and 1 RIR), so I don't need to deal with heating lamps. Since you're in Michigan, have you thought of insulating in any way...? Someone suggested using styrofoam, which allows the body heat of the hens to keep the hen house warm...so I haven't researched pros/cons of this. Thx!